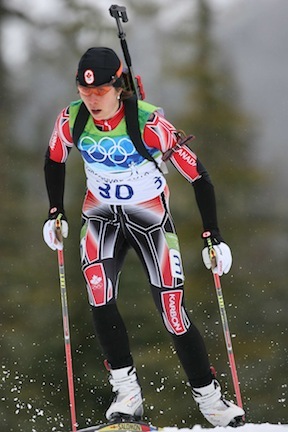 Falcon Lake’s local Olympic biathlete is on the home stretch to the Sochi 2014 Olympics, her second Olympic games. As she travels from country-to-country to race, Imrie receives support from many, including the Rocky Mountain Soap Company. The company is selling their limited edition Great White North Soap with all proceeds going toward Imrie’s Olympic journey. For all you Manitobans, the soap is available at the Rocky Mountain Soap store in Polo Park Shopping Centre. Tomorrow in Italy, Imrie will be competing in a sprint race followed with pursuit and relay races on the weekend. Her parents have flown in from Manitoba and are there to cheer her on as she makes her last laps before heading into the Olympics. Experience the Whiteshell would like to wish Megan Imrie the best of luck in her races this weekend. Go Megan go! This entry was tagged Biathlon, Falcon Lake, Italy, Megan Imrie, Olympian, Olympics, Rocky Mountain Soap Company, Russia, Sochi 2014, whiteshell provincial park. Bookmark the permalink.